Solar InCell™ is a 100% autonomous and connected solar irradiance sensor. This drop-and-play irradiation measurement device helps develop, manage and monitor photovoltaic plants on a daily basis. Before developing a solar project, monitor the solar irradiance on an identified site thanks to Solar InCell™ and its included solar reference cells. The station is ready-to-use and no wiring is required. During the operations phase, Solar InCell™ allows to compare the plant’s output with the received solar irradiance at any moment. The real time comparison between the electric production and the incoming irradiance enables to detect outages and failures with great accuracy and no false alarms. 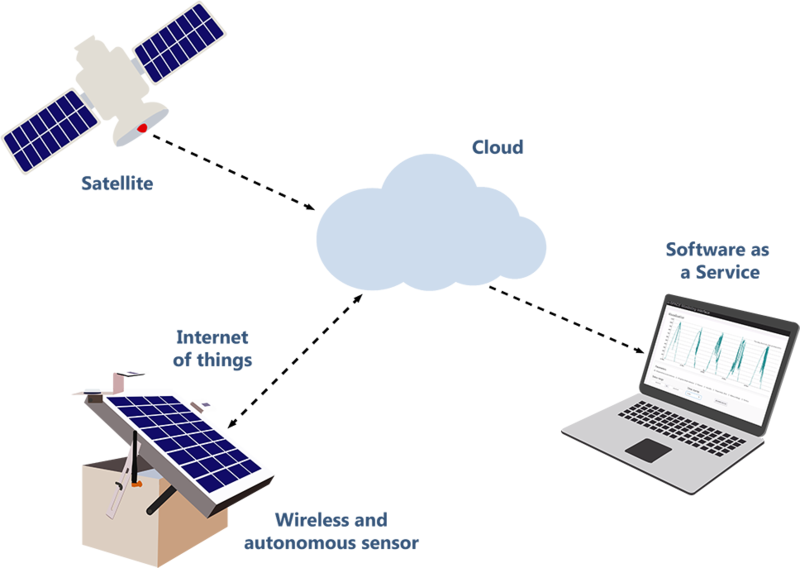 Solar InCell™ delivers a real-time solar resource evaluation service through a SaaS (Software as a Service) platform, built on a system that uses an IoT (Internet of Things) based solar irradiance measurement device, and satellite data issuing from meteorological satellites. In order to certify the solar potential of a previously identified site, Solar InCell™ can measure its solar irradiance, or GHI (Global Horizontal Irradiance) on a one-year period and thus definitely validate its PV potential and bankability. Thanks to a second solar reference cell and other meteorological sensors, it is also capable of measuring irradiance in the tilt of the panels, or GTI (Global Tilted Irradiance), as well as temperature and air humidity. Another advantages of Solar InCell™ is that it enables to grasp the high frequency dynamics of these parameters, by measuring data with a minutely granularity. This makes it the ideal validation tool for PV project developers, confirming or rejecting the site’s bankability. Solar InCell™ enables the GHI data hitherto collected to be transferred to the developers’ monitoring portal in the desired format or through Reuniwatt’s online interface. These measured on-site values are necessary if one wants to define their installation’s Performance Ratio (PR). PR translates into the ratio between power delivered and the theoretically possible energy yield (meaning the solar radiation). By comparing these on-site measures with their plant’s production, developers can quickly and easily target any malfunction that may occur, such as damaged solar panels, cut cables, lazy inverters, melted fuses… and act accordingly. The photovoltaic plant owners now have an operating tool that can assist them in the management of their installations. Solar InCell™ is also equipped with a weather station including temperature, humidity and pressure sensors on top of the already described irradiance sensor. The irradiance measurements, which Solar InCell™ wirelessly transfers to the cloud, are continuously fine-tuned using satellite images, guaranteeing a maximal reliability of the measured data. During the plant’s operational phase, irradiance data history collected by Solar InCell™’s cells can also be used to improve the quality of the irradiance predictions delivered by Reuniwatt’s solar power forecasting tool. These data can help provide a statistical post-treatment thanks to an MOS (Model Output Statistics) so the climate specificities of the site are taken into account.